Clean and disinfect multiple surfaces in one easy step. These sanitizing wipes power through grease, soap scum and grime and kill germs that can live on surfaces for up to 48 hours. Each cleaning wipe can effectively kill common bacteria, including staph, salmonella, strep, MRSA, e.coli and the cold and flu viruses, human coronavirus and influenza A2 virus, in as little as 30 seconds. They also remove allergens like car and dog dander, dust mite debris and pollen. These antibacterial wipes are easy to use and work great on a variety of hard, non-porous surfaces including finished hardwood, stainless steel, mirrors and glass. Ideal for use in schools, restaurants, offices and other commercial facilities. Towel/Wipe Type: Disinfecting Wipes; Application: Bathrooms; Gyms; Hospitals; Kitchens; Offices; Schools; Day Care Centers; Applicable Material: Acrylic, Ceramic, Chrome, Fiberglass, Glass, Metal, Plastic, Tile, Vinyl, Wood; Material(s): Non-Woven Fiber. 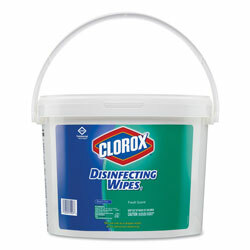 Disinfecting Wipes, Cleaners and Sanitizers from Clorox! 1050 In Stock today. I would reourchase again and again. I made the first purchase of this product for the house, for which it worked excellent. So I repurchased this same product for work which is a dustier place, in which it would work even better. People at work eere already asking where did I get this product and I told them at www.restockit.com. I was very upset due to I let my daughter take home my last bucket to use. Now I am without a lid and cannot use this item.